Traditionally Indian and Victorian aesthetic sensibilities for designing jewelry used to be poles apart. Traditional Indian jewelry is characterized by bulky stature, intricate attention to detail and were considered to be steed horn items. Victorian jewelry on the other hand was minimal in terms of its size and structure yet it too was brought to life using various adornments that were considered to be a sign of status and wealth. With the passage of time a unique fusion of these two distinct styles of jewelry evolved which incorporated design elements from both these different schools of design known as Indian Victorian jewelry. Indian Victorian jewelry tends to be very ornate and decorative. Traditional elements of Indian jewelry design such as motifs inspired by nature are incorporated into Victorian style jewelry articles such as chandelier earrings and silver chokers. The use of diamonds was common amongst these two distinct styles. However the way in which they were incorporated into the jewelry article differed. The Indians would follow a traditional method of using nine stones in a setting which was believed to have religious significance. Victorian jewelry on the other hand focused on brilliant cuts such as the cushion cut and the rose cut diamonds. A fine example of Indian Victorian jewelry are diamond beaded necklaces. Indian jewelry is renowned world over for its craftsmanship. Every jewelry article was meticulously handmade which added to the glamour and the value of the jewelry. Victorian jewelry on the other hand was made using machines. Although handmade jewelry is still considered to be more valuable, Victorian jewelry was far more cost effective to produce. When it comes to Indian Victorian jewelry both these elements are combined to produce brilliant works of jewelry that have some of the elements made using machines whereas the other elements such as intricate carvings are still handmade. The combination produces jewelry objects of unmatched quality. We will also be able to find Indian Victorian jewelry taking inspiration from antique vintage jewelry to bring back reminiscences from the past. Such jewelry is characterized by grandeur, glamour and uniqueness which makes them an excellent choice for bridal wear. Indian Victorian jewelry is also commonly used as costume jewelry in theatrical performances. With the passage of time Indian women started losing interest in traditional style Indian jewelry because it was extremely difficult to manage because of the bulky nature. They wanted something that was more wearable yet had the similar charm of traditional Indian designs. This is where Indian Victorian jewelry came in as the ideal alternative. Jewelry modeled on this concept was inspired by minimalism which is the latest fashion trend amongst fashion conscious women. Examples of Indian Victorian jewelry based on minimalistic trends include Victorian-style necklaces that are known with diamonds and finished off with turquoise beads. The use of multicolor precious stones in the traditional Victorian style necklace is also a fine example of the unique style. 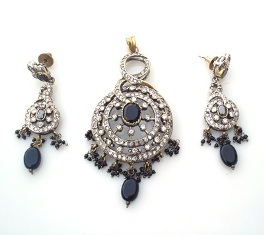 Indian Victorian jewelry pieces are often given a deliberate antiqued finish to give them a vintage look.